Anarcho-syndicalism (also referred to as revolutionary syndicalism) is a theory of anarchism that views revolutionary industrial unionism or syndicalism as a method for workers in capitalist society to gain control of an economy and thus control influence in broader society. Syndicalists consider their economic theories a strategy for facilitating worker self-activity and as an alternative co-operative economic system with democratic values and production centered on meeting human needs. The basic principles of anarcho-syndicalism are solidarity, direct action (action undertaken without the intervention of third parties such as politicians, bureaucrats and arbitrators) and direct democracy, or workers' self-management. The end goal of syndicalism is to abolish the wage system, regarding it as wage slavery. Anarcho-syndicalist theory therefore generally focuses on the labour movement. Anarcho-syndicalists view the primary purpose of the state as being the defense of private property, and therefore of economic, social and political privilege, denying most of its citizens the ability to enjoy material independence and the social autonomy that springs from it. Reflecting the anarchist philosophy from which it draws its primary inspiration, anarcho-syndicalism is centred on the idea that power corrupts and that any hierarchy that cannot be ethically justified must either be dismantled or replaced by decentralized egalitarian control. Hubert Lagardelle wrote that Pierre-Joseph Proudhon laid out fundamental ideas of anarcho-syndicalism and repudiated both capitalism and the state in the process since he viewed free economic groups and struggle, not pacifism, as dominant in humans. In September 1903 and March 1904, Sam Mainwaring published in Britain two issues of a short-lived newspaper called The General Strike, a publication that made detailed criticisms of the "officialism" of union bureaucracy and publicized strikes in Europe making use of syndicalist tactics. In 1910, the Confederación Nacional del Trabajo (CNT) was founded in the middle of the restoration in Barcelona in a congress of the Catalan trade union Solidaridad Obrera (Workers' Solidarity) with the objective of constituting an opposing force to the then-majority trade union, the socialist UGT and "to speed up the economic emancipation of the working class through the revolutionary expropriation of the bourgeoisie". The CNT started small, counting 26,571 members represented through several trade unions and other confederations. In 1911, coinciding with its first congress, the CNT initiated a general strike that provoked a Barcelona judge to declare the union illegal until 1914. That same year of 1911, the trade union officially received its name. From 1918 on, the CNT grew stronger and had an outstanding role in the events of the La Canadiense general strike, which paralyzed 70% of industry in Catalonia in 1919, the year the CNT reached a membership of 700,000. Around that time, panic spread among employers, giving rise to the practice of pistolerismo (employing thugs to intimidate active unionists), causing a spiral of violence that significantly affected the trade union. These pistoleros are credited with killing 21 union leaders in 48 hours. In 1922, the International Workers' Association (IWA) was founded in Berlin and the CNT joined immediately, but with the rise of Miguel Primo de Rivera's dictatorship the labor union was outlawed once again the following year. However, with the workers' movement resurgent following the Russian Revolution, what was to become the modern IWA was formed, billing itself as the "true heir" of the original International. 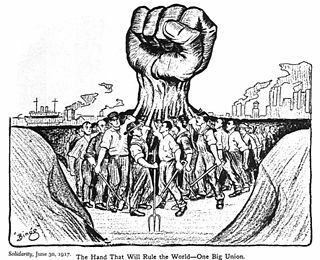 The successful Bolshevik-led revolution of 1918 in Russia was mirrored by a wave of syndicalist successes worldwide, including the struggle of the Industrial Workers of the World (IWW) in the United States alongside the creation of mass anarchist unions across Latin America and huge syndicalist-led strikes in Germany, Portugal, Spain, Italy and France, where it was noted that "neutral (economic, but not political) syndicalism had been swept away". The final formation of this new International, then known as the International Workingmen's Association, took place at an illegal conference in Berlin in December 1922, marking an irrevocable break between the international syndicalist movement and the Bolsheviks. The first secretaries of the International included the famed writer and activist Rudolph Rocker, along with Augustin Souchy and Alexander Schapiro. Following the first congress, other groups affiliated from France, Austria, Denmark, Belgium, Switzerland, Bulgaria, Poland and Romania. Later, a bloc of unions in the United States, Colombia, Peru, Ecuador, Guatemala, Cuba, Costa Rica and El Salvador also shared the IWA's statutes. 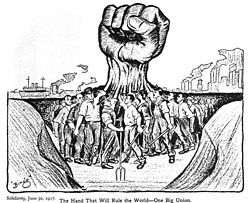 The biggest syndicalist union in the United States was the IWW and considered joining, but eventually ruled out affiliation in 1936 by citing the IWA's policies on religious and political affiliation. Although not anarcho-syndicalist, the IWW were informed by developments in the broader revolutionary syndicalist milieu at the turn of the 20th century. At its founding congress in 1905, influential members with strong anarchist or anarcho-syndicalist sympathies like Thomas J. Hagerty, William Trautmann and Lucy Parsons contributed to the union's overall revolutionary syndicalist orientation. Although the terms anarcho-syndicalism and revolutionary syndicalism are often used interchangeably, the anarcho-syndicalist label was not widely used until the early 1920s: "The term ‘anarcho-syndicalist' only came into wide use in 1921–1922 when it was applied polemically as a pejorative term by communists to any syndicalists…who opposed increased control of syndicalism by the communist parties". In fact, depending on the translation the original statement of aims and principles of the IWA (drafted in 1922) refers not to anarcho-syndicalism, but to revolutionary syndicalism or revolutionary unionism. The Biennio Rosso (English: "Red Biennium") was a two-year period between 1919 and 1920 of intense social conflict in Italy following the World War I. The Biennio Rosso took place in a context of economic crisis at the end of the war, with high unemployment and political instability. It was characterized by mass strikes, worker manifestations as well as self-management experiments through land and factories occupations. In Turin and Milan, workers councils were formed and many factory occupations took place under the leadership of anarcho-syndicalists. The agitations also extended to the agricultural areas of the Padan plain and were accompanied by peasant strikes, rural unrests and guerilla conflicts between left-wing and right-wing militias. According to libcom.org, the anarcho-syndicalist trade union Unione Sindacale Italiana (USI) "grew to 800,000 members and the influence of the Italian Anarchist Union (20,000 members plus Umanita Nova, its daily paper) grew accordingly [...] Anarchists were the first to suggest occupying workplaces". Many of the largest members of the IWA were broken, driven underground or wiped out in the 1920s–1930s as fascists came to power in states across Europe and workers switched away from anarchism towards the seeming success of the Bolshevik model of socialism. In Argentina, the FORA had already begun a process of decline by the time it joined the IWA, having split in 1915 into pro and anti-Bolshevik factions. From 1922, the anarchist movement there lost most of its membership, exacerbated by further splits, most notably around the Severino Di Giovanni affair. It was crushed by General Uriburu's military coup in 1930. 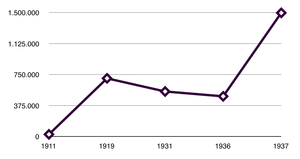 Germany's FAUD struggled throughout the late 1920s and early 1930s as the Brownshirts took control of the streets. Its last national congress in Erfurt in March 1932 saw the union attempt to form an underground bureau to combat Adolf Hitler's fascists, a measure that was never put into practice as mass arrests decimated the conspirators' ranks. The editor of the FAUD organ Der Syndikalist, Gerhard Wartenberg, was killed in Sachsenhausen concentration camp. Karl Windhoff, delegate to the IWA Madrid congress of 1931, was driven out of his mind and also died in a Nazi death camp. There were also mass trials of FAUD members held in Wuppertal and Rhenanie, many of these never survived the death camps. Italian IWA union USI, which had claimed a membership of up to 600,000 people in 1922, was warning even at that time of murders and repression from Benito Mussolini's fascists. It had been driven underground by 1924 and although it was still able to lead significant strikes by miners, metalworkers and marble workers, Mussolini's ascent to power in 1925 sealed its fate. By 1927, its leading activists had been arrested or exiled. Portugal's CGT was driven underground after an unsuccessful attempt to break the newly installed dictatorship of Gomes da Costa with a general strike in 1927 that led to nearly 100 deaths. It survived underground with 15,–20,000 members until January 1934, when it called a general revolutionary strike against plans to replace trade unions with fascist corporations, which failed. It was able to continue in a much reduced state until World War II, but was effectively finished as a fighting union. Massive government repression repeated such defeats around the world as anarcho-syndicalist unions were destroyed in Peru, Brazil, Colombia, Japan, Cuba, Bulgaria, Paraguay and Bolivia. By the end of the 1930s, legal anarcho-syndicalist trade unions existed only in Chile, Bolivia, Sweden and Uruguay. However, perhaps the greatest blow was struck in the Spanish Civil War, which saw the CNT, then claiming a membership of 1.58 million, driven underground with the defeat of the Spanish Republic by Francisco Franco. 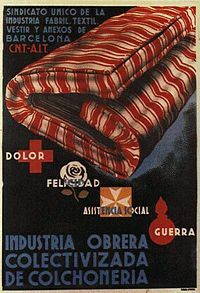 The sixth IWA congress took place in 1936, shortly after the Spanish Revolution had begun, but was unable to provide serious material support for the section. The IWA held its last pre-war congress in Paris in 1938, with months to go before the German invasion of Poland it received an application from ZZZ, a syndicalist union in the country claiming up to 130,000 workers—ZZZ members went on to form a core part of the resistance against the Nazis and participated in the Warsaw uprising. However, the International was not to meet again until after World War II had finished in 1951. During the war, only one member of the IWA was able to continue to function as a revolutionary union, the SAC in Sweden. In 1927, with the "moderate" positioning of some cenetistas (CNT members) the Federación Anarquista Ibérica (FAI), an association of anarchist affinity groups, was created in Valencia. The FAI would play an important role during the following years through the so-called trabazón (connection) with the CNT; that is, the presence of FAI elements in the CNT, encouraging the labor union not to move away from its anarchist principles, an influence that continues today. On 1 June 1936, the CNT joined the UGT in declaring a strike of "building workers, mechanics, and lift operators". A demonstration was held, 70,000 workers strong. Members of the Falange attacked the strikers. The strikers responded by looting shops, and the police reacted by attempting to suppress the strike. By the beginning of July, the CNT was still fighting while the UGT had agreed to arbitration. In retaliation to the attacks by the Falangists, anarchists killed three bodyguards of the Falangist leader José Antonio Primo de Rivera. The government then closed the CNT's centers in Madrid and arrested David Antona and Cipriano Mera, two CNT militants. I had dropped more or less by chance into the only community of any size in Western Europe where political consciousness and disbelief in capitalism were more normal than their opposites. Up here in Aragón one was among tens of thousands of people, mainly though not entirely of working-class origin, all living at the same level and mingling on terms of equality. In theory it was perfect equality, and even in practice it was not far from it. There is a sense in which it would be true to say that one was experiencing a foretaste of Socialism, by which I mean that the prevailing mental atmosphere was that of Socialism. Many of the normal motives of civilised life– snobbishness, money-grubbing, fear of the boss, etc.– had simply ceased to exist. The ordinary class-division of society had disappeared to an extent that is almost unthinkable in the money-tainted air of England; there was no one there except the peasants and ourselves, and no one owned anyone else as his master. Some of the most important communities in this respect were those of Alcañiz, Calanda, Alcorisa, Valderrobres, Fraga or Alcampel. Not only were the lands collectivized, but collective labours were also undertaken, like the retirement home in Fraga, the collectivization of some hospitals (such as in Barbastro or Binéfar) and the founding of schools such as the School of Anarchist Militants. These institutions would be destroyed by the Nationalist troops during the war. The Committee held an extraordinary regional plenary session to protect the new rural organization, gathering all the union representatives from the supporting villages and backed by Buenaventura Durruti. Against the will of the mainly Catalan CNT National Committee, the Regional Defence Council of Aragon was created. Following Largo Caballero's assumption of the position of Prime Minister of the government, he invited the CNT to join in the coalition of groups making up the national government. The CNT proposed instead that a National Defense Council should be formed, led by Largo Caballero; and containing five members each from the CNT and UGT and four "liberal republicans". When this proposal was declined, the CNT decided not to join the government. However, in Catalonia the CNT joined the Central Committee of the Anti-Fascist Militias, which joined the Generalitat on 26 September. For the first time, three members of the CNT were also members of the government. In November, Caballero once again asked the CNT to become part of the government. The leadership of the CNT requested the finance and war ministries as well as three others, but were given four posts, the ministries of health, justice, industry and commerce. Federica Montseny became Minister of Health, the first female minister in Spain. As minister of justice, Juan García Oliver abolished legal fees and destroyed all criminal files. Shortly afterwards, despite the disapproval of the anarchist ministers the capital was moved from Madrid to Valencia. On 23 December 1936, after receiving in Madrid a retinue formed by Joaquín Ascaso, Miguel Chueca and three republican and independent leaders, the government of Largo Caballero, which by then had four anarchists as ministers (García Oliver, Juan López, Federica Montseny and Joan Peiró), approved the formation of the National Defense Committee. It was a revolutionary body that represented anarchists as much as socialists and republicans. Halfway through February 1937, a congress took place in Caspe with the purpose of creating the Regional Federation of Collectives of Aragon. 456 delegates, representing more than 141,000 collective members, attended the congress. The congress was also attended by delegates of the National Committee of the CNT. At a plenary session of the CNT in March 1937, the national committee asked for a motion of censure to suppress the Aragonese Regional Council. The Aragonese regional committee threatened to resign, which thwarted the censure effort. Although there had always been disagreements, that spring also saw a great escalation in confrontations between the CNT-FAI and the Communists. In Madrid, Melchor Rodríguez, who was then a member of the CNT and director of prisons in Madrid, published accusations that the Communist José Cazorla, who was then overseeing public order, was maintaining secret prisons to hold anarchists, socialists and other republicans; and either executing, or torturing them as "traitors". Soon after, on this pretext Largo Caballero dissolved the Communist-controlled Junta de Defensa. Cazorla reacted by closing the offices of Solidaridad Obrera. The next day, CNT's regional committee declared a general strike. The CNT controlled the majority of the city, including the heavy artillery on the hill of Montjuïc overlooking the city. CNT militias disarmed more than 200 members of the security forces at their barricades, allowing only CNT vehicles to pass through. After unsuccessful appeals from the CNT leadership to end the fighting, the government began transferring Assault Guard from the front to Barcelona, and even destroyers from Valencia. On 5 May, the Friends of Durruti issued a pamphlet calling for "disarming of the paramilitary police… dissolution of the political parties…" and declared "Long live the social revolution! – Down with the counter-revolution! ", though the pamphlet was quickly denounced by the leadership of the CNT. The next day, the government agreed to a proposal by the leadership of the CNT-FAI that called for the removal of the Assault Guards and no reprisals against libertarians that had participated in the conflict in exchange for the dismantling of barricades and end of the general strike. However, neither the PSUC or the Assault Guards gave up their positions and according to historian Antony Beevor "carried out violent reprisals against libertarians". By 8 May, the fighting was over. These events, the fall of Largo Caballero's government and the new prime ministership of Juan Negrín soon led to the collapse of much that the CNT had achieved immediately following the rising the previous July. At the beginning of July, the Aragonese organizations of the Popular Front publicly declared their support for the alternative council in Aragon, led by their president, Joaquín Ascaso. Four weeks later, the 11th Division under Enrique Líster entered the region. On 11 August 1937, the Republican government, now situated in Valencia, dismissed the Regional Council for the Defense of Aragon. Líster's division was prepared for an offensive on the Aragonese front, but they were also sent to subdue the collectives run by the CNT-UGT and in dismantling the collective structures created the previous twelve months. The offices of the CNT were destroyed and all the equipment belonging to its collectives was redistributed to landowners. 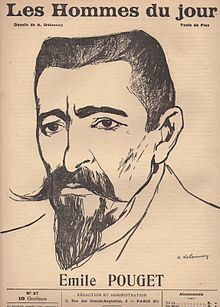 The CNT leadership not only refused to allow the anarchist columns on the Aragon front to leave the front to defend the collectives, but they failed to condemn the government's actions against the collectives, causing much conflict between it and the rank and file membership of the union. In April 1938, Juan Negrín was asked to form a government and included Segundo Blanco, a member of the CNT, as minister of education; and by this point, the only CNT member left in the cabinet. At this point, many in the CNT leadership were critical of participation in the government, seeing it as dominated by the Communists. Prominent CNT leaders went so far as to refer to Blanco as "sop of the libertarian movement" and "just one more Negrínist". On the other side, Blanco was responsible for installing other CNT members into the ministry of education and stopping the spread of "Communist propaganda" by the ministry. In March 1939, with the war nearly over, CNT leaders participated in the National Defense Council's coup overthrowing the government of the Socialist Juan Negrín. Those involved included the CNT's Eduardo Val and José Manuel González Marín serving on the council, while Cipriano Mera's 70th Division provided military support, and Melechor Rodríquez became mayor of Madrid. The Council attempted to negotiate a peace with Franco, though he granted virtually none of their demands. After World War II, an appeal in the Fraye Arbeter Shtime detailing the plight of German anarchists and called for Americans to support them. By February 1946, the sending of aid parcels to anarchists in Germany was a large-scale operation. In 1947, Rudolf Rocker published Zur Betrachtung der Lage in Deutschland (Regarding the Portrayal of the Situation in Germany) about the impossibility of another anarchist movement in Germany. It became the first post-World War II anarchist writing to be distributed in Germany. Rocker thought young Germans were all either totally cynical or inclined to fascism and awaited a new generation to grow up before anarchism could bloom once again in the country. Nevertheless, the Federation of Libertarian Socialists (FFS) was founded in 1947 by former FAUD members. Rocker wrote for its organ, Die Freie Gesellschaft, which survived until 1953. In 1949, Rocker published another well-known work. On 10 September 1958, Rocker died in the Mohegan Colony. The Syndicalist Workers' Federation was a syndicalist group in active in post-war Britain and one of the Solidarity Federation's earliest predecessors. It was formed in 1950 by members of the dissolved Anarchist Federation of Britain. Unlike the AFB, which was influenced by anarcho-syndicalist ideas but ultimately not syndicalist itself, the SWF decided to pursue a more definitely syndicalist, worker-centred strategy from the outset. The Confédération nationale du travail (CNT, or National Confederation of Labour) was founded in 1946 by Spanish anarcho-syndicalists in exile with former members of the CGT-SR. The CNT later split into the CNT-Vignoles and the CNT-AIT, which is the French section of the IWA. At the seventh congress in Toulouse in 1951, a much smaller IWA was relaunched again without the CNT, which would not be strong enough to reclaim membership until 1958 as an exiled and underground organization. Delegates attended, though mostly representing very small groups, from Cuba, Argentina, Spain, Sweden, France, Italy, Germany, the Netherlands, Austria, Denmark, Norway, Britain, Bulgaria and Portugal. A message of support was received from Uruguay, but the situation remained difficult for the International as it struggled to deal with the rise of state-sanctioned economic trade unionism in the West, heavy secret service intervention as Cold War anti-communism reached its height and the banning of all strikes and free trade unions in the Soviet Union bloc of countries. At the tenth congress in 1958, the SAC's response to these pressures led it into a clash with the rest of the international. It withdrew from the IWA following its failure to amend the body's statutes to allow it to stand in municipal elections and amid concerns over its integration with the state over distribution of unemployment benefits. For most of the next two decades, the international struggled to prebuild itself. In 1976 at the 15th congress, the IWA had only five member groups, two of which (the Spanish and Bulgarian members) were still operating in exile (though following Franco's death in 1975, the CNT was already approaching a membership of 200,000). The Direct Action Movement was formed in 1979, when the one remaining SWF branch, along with other smaller anarchist groups, decided to form a new organisation of anarcho-syndicalists in Britain. The DAM was highly involved in the Miners' Strike as well as a series of industrial disputes later in the 1980s, including the Ardbride dispute in Ardrossan, Scotland, involving a supplier to Laura Ashley, for which the DAM received international support. From 1988 in Scotland, then England and Wales, the DAM was active in opposing the Poll Tax. In March 1994, DAM changed to its current name, the Solidarity Federation, having previously been the Direct Action Movement since 1979 and before that the Syndicalist Workers' Federation since 1950. Presently, the Solidarity Federation publishes the quarterly magazine Direct Action (presently on hiatus) and the newspaper Catalyst. In 1979, a split over representative unionism, professional unionism and state-funded schemes saw the CNT divided into two sections, the CNT as it is today and the Confederacion General del Trabajo. After Franco's death in November 1975 and the beginning of Spain's transition to democracy, the CNT was the only social movement to refuse to sign the 1977 Moncloa Pact, an agreement amongst politicians, political parties and trade unions to plan how to operate the economy during the transition. In 1979, the CNT held its first congress since 1936 as well as several mass meetings, the most remarkable one in Montjuïc. Views put forward in this congress would set the pattern for the CNT's line of action for the following decades: no participation in union elections, no acceptance of state subsidies, no acknowledgment of works councils and support of union sections. In this first congress, held in Madrid, a minority sector in favor of union elections split from the CNT, initially calling themselves CNT Valencia Congress (referring to the alternative congress held in this city) and later Confederación General del Trabajo (CGT) after an April 1989 court decision determined that they could not use the CNT initials. In 1990, a group of CGT members left this union because they rejected the CGT's policy of accepting government subsidies, founding Solidaridad Obrera. One year before, the 1978 Scala Case affected the CNT. An explosion killed three people in a Barcelona night club. The authorities alleged that striking workers "blew themselves up" and arrested surviving strikers, implicating them in the crime. CNT members declared that the prosecution sought to criminalize their organization. After its legalization, the CNT began efforts to recover the expropriations of 1939. The basis for such recovery would be established by Law 4/1986, which required the return of the seized properties and the unions' right to use or yield the real estate. Since then, the CNT has been claiming the return of these properties from the State. In 1996, the Economic and Social Council facilities in Madrid were squatted by 105 CNT militants. This body is in charge of the repatriation of the accumulated union wealth. In 2004, an agreement was reached between the CNT and the District Attorney's Office, through which all charges were dropped against the hundred prosecuted for this occupation. On 3 September 2009, six members of the Serbian IWA section (ASI-MUR), including then-IWA General Secretary Ratibor Trivunac, were arrested on suspicion of international terrorism, a charge that was heavily disputed by the international and other anarchist groups. Shortly after their arrest, an open letter was circulated by Serbian academics criticizing the charges and the attitude of Serbian police. The six were formally indicted on 7 December and after a lengthy trial procedure Trivunac, along with other five anarchists, were freed on 17 February 2010. On 10 December 2009, the FAU local in Berlin was effectively banned as a union following a public industrial dispute at the city's Babylon cinema. At the XXIV annual congress of the IWA which was held in Brazil in December 2009, the first time the congress had been held outside Europe, motions of support were passed for the "Belgrade Six" and FAU while members of the Solidarity Federation temporarily took over duties as Secretariat. The International's Norwegian section subsequently took on the Secretariat role in 2010. As part of the anti-austerity movement in Europe, various IWA sections have been highly active in the 2008–2012 period, with the CNT taking a leading role in agitating for the general strikes that have occurred in Spain, the USI in Milan taking on anti-austerity campaigns in the health service and the ZSP organizing tenants against abuses in rented accommodation. The largest organised anarchist movement today is in Spain in the form of the Confederación General del Trabajo (CGT) and the CNT. CGT membership was estimated at around 100,000 for 2003. The regions with the largest CNT membership are the Centre (Madrid and surrounding area), the North (Basque country), Andalucía, Catalonia and the Balearic Islands. The CNT opposes the model of union elections and workplace committees and is critical of labor reforms and the UGT and the CCOO, standing instead on a platform of reivindicación; that is, "return of what is due", or social revolution. The following organizations are either member groups or friends of the IWA. Friends of the IWA are regarded as semi-official fellow travelers politically but have not formally joined and do not have voting rights at Congress. They are often invited to send observers to Congress. Anarcho-syndicalists believe that direct action—action carried out by workers as opposed to indirect action, such as electing a representative to a government position—would allow workers to liberate themselves. Anarcho-syndicalists believe that workers' organisations that oppose the wage system will eventually form the basis of a new society and should be self-managing. They should not have bosses or "business agents"; rather, the workers alone should decide on that which affects them. Rudolf Rocker is one of the most influential figures in the anarcho-syndicalist movement. Now a federated, decentralised system of free associations, incorporating economic as well as other social institutions, would be what I refer to as anarcho-syndicalism; and it seems to me that this is the appropriate form of social organisation for an advanced technological society in which human beings do not have to be forced into the position of tools, of cogs in the machine. There is no longer any social necessity for human beings to be treated as mechanical elements in the productive process; that can be overcome and we must overcome it to be a society of freedom and free association, in which the creative urge that I consider intrinsic to human nature will in fact be able to realize itself in whatever way it will. As "practical" and "realistic" as anarcho-syndicalism may seem, it represents in my view an archaic ideology rooted in a narrowly economistic notion of bourgeois interest, indeed of a sectorial interest as such. It relies on the persistence of social forces like the factory system and the traditional class consciousness of the industrial proletariat that are waning radically in the Euro-American world in an era of indefinable social relations and ever-broadening social concerns. Broader movements and issues are now on the horizon of modern society that, while they must necessarily involve workers, require a perspective that is larger than the factory, trade union, and a proletarian orientation. Bookchin has said that it prioritizes the interests of the working class, instead of communal freedom for society as a whole; and that this view ultimately prevents a true revolution. He argues that in instances like the Spanish Revolution, it was in spite of the syndicalist-minded CNT leadership that the revolution occurred. The organisation of Anarcho-Syndicalism is based upon the principles of Federalism, on free combination from below upwards, putting the right of self-determination of every member above everything else and recognising only the organic agreement of all on the basis of like interests and common convictions. Anarcho-syndicalism therefore is not apolitical but instead sees political and economic activity as the same. Unlike the propositions of some of its critics, anarcho-syndicalism is different from reformist union activity in that it aims to obliterate capitalism as "[anarcho-syndicalism] has a double aim: with tireless persistence, it must pursue betterment of the working class's current conditions. But, without letting themselves become obsessed with this passing concern, the workers should take care to make possible and imminent the essential act of comprehensive emancipation: the expropriation of capital". At the same time that syndicalism exerts this unrelenting pressure on capitalism, it tries to build the new social order within the old. The unions and the 'labour councils' are not merely means of struggle and instruments of social revolution; they are also the very structure around which to build a free society. The workers are to be educated [by their own activity within the union] in the job of destroying the old propertied order and in the task of reconstructing a stateless, libertarian society. The two go together. The 1975 film Monty Python and the Holy Grail makes reference to anarcho-syndicalism. In a scene with a character named Dennis, King Arthur becomes frustrated by Dennis' explanation of the anarcho-syndicalist commune in which he lives, a situation exacerbated when Dennis insults Arthur's claim to Excalibur and kingship of the Britons. Arthur becomes fed up and assaults Dennis before leaving, an incident that Dennis refers to as "the violence inherent in the system". Ursula K. Le Guin's novel The Dispossessed (1974) shows a fictional functioning anarcho-syndicalist society. The novel is subtitled "An Ambiguous Utopia". Living Utopia, (Vivir la utopía, documentary-film from 1997 about anarcho-syndicalism and anarchism in Spain). Noam Chomsky's The Relevance of Anarcho-syndicalism (interviewed by Peter Jay, 1976) (video and text). ^ a b "1c. Why do anarcho-syndicalists oppose participation in statist politics?". Anarcho-Syndicalism 101. Class Struggle Online. April 2002. Archived from the original on 18 June 2013. Retrieved 20 June 2013. ^ Jameson, J. F., The American Historical Review (American Historical Association, 1895), p. 731. ^ "The Great Dock Strike of 1889," Direct Action #47, 11 August 2009. Retrieved 8 March 2010. ^ a b c d "1860-today: The International Workers Association". Libcom.org. 2006. Retrieved 29 September 2009. ^ a b Brunella Dalla Casa, Composizione di classe, rivendicazioni e professionalità nelle lotte del "biennio rosso" a Bologna, in: AA. VV, Bologna 1920; le origini del fascismo, a cura di Luciano Casali, Cappelli, Bologna 1982, p. 179. ^ "Organise Magazine issue 65". 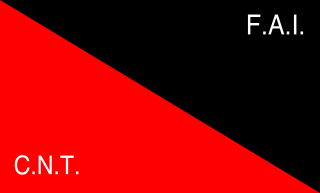 Anarchist Federation. 2005. Archived from the original on 1 December 2008. Retrieved 29 September 2009. ^ a b "Global anarcho-syndicalism 1939-99" (PDF). Selfed. 2001. Archived from the original (PDF) on 19 February 2012. Retrieved 29 September 2009. ^ "The IWA today – South London DAM". DAM-IWA. 1985. Retrieved 23 April 2011. ^ a b c Encyclopedia of British and Irish Political Organizations'. United Kingdom: Pinter Publishers. 2000. ISBN 978-1855672642. ^ Meltzer, Albert (2001). I Couldn't Paint Golden Angels. United Kingdom: AK Press. ISBN 978-1873176931. ^ "FAQ". Archived from the original on 9 February 2008. Un sector minoritario que es partidario de las elecciones sindicales se escinde y pasa a llamarse CNT congreso de valencia (en referencia al Congreso alternativo realizado en esa ciudad) y posteriormente, perdidas judicialmente las siglas, a CGT. ^ (in Spanish) A series of three articles about the Scala Case from the CNT point of view: (1) El Caso Scala. Un proceso contra el anarcosindicalismo Archived 30 June 2006 at the Wayback Machine, ("The Scala Case. A trial against anarcho-syndicalism"), Jesús Martínez, Revista Polémica online, 1 February 2006; (2) Segunda parte. El proceso Archived 30 June 2006 at the Wayback Machine ("Second part: the trial") 31 January 2006; (3) Tercera parte. El canto del Grillo Archived 30 June 2006 at the Wayback Machine ("Third part: Grillo's song") 31 January 2006. All accessed online 6 January 2008. ^ "Los 117 detenidos de la CNT, en libertad tras prestar declaración". El Mundo (in Spanish). 7 December 1996. Retrieved 14 January 2008. ^ Carley, Mark "Trade union membership 1993–2003" (International:SPIRE Associates 2004). ^ Beltrán Roca Martínez, "Anarchism, Anthropology and Andalucia", Anarchist Studies 14 (2). ^ (in Spanish) ¿Que son las elecciones sindicales? Archived 9 February 2008 at the Wayback Machine, official CNT site. Accessed online 6 January 2008. ^ (in Spanish) Otra reforma laboral ¿Y ahora qué? Archived 26 February 2008 at the Wayback Machine, official CNT site. Accessed online 6 January 2008. ^ (in Spanish) Plataforma Reivindicativa Archived 29 January 2008 at the Wayback Machine, official CNT site. Accessed online 6 January 2008. ^ a b Murray Bookchin, The Ghost of Anarcho-Syndicalism, online at Anarchy Archives Archived 3 January 2009 at the Wayback Machine. Retrieved 27 January 2009. Van Deusen, David, The Rise And Fall of The Green Mountain Anarchist Collective, The Anarchist Library, 2015. Van Deusen, David & West, Sean & the Green Mountain Anarchist Collective, Neither Washington Nor Stowe: Common Sense For The Working Vermonter, Catamount Tavern Press, 2004. 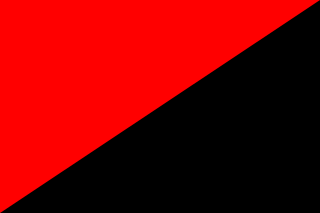 Wikimedia Commons has media related to Anarcho-syndicalism. Syndicalism is a radical current in the labor movement and was most active in the early 20th century. Its main idea is worker-based local organization and advancement through strikes. According to the Marxist historian Eric Hobsbawm, it predominated the revolutionary left in the decade preceding World War I as Marxism was mostly reformist at that time. Major syndicalist organizations included the General Confederation of Labor in France, the National Confederation of Labor in Spain, the Italian Syndicalist Union, the Free Workers' Union of Germany, and the Argentine Regional Workers' Federation. The Industrial Workers of the World, the Irish Transport and General Workers' Union and the Canadian One Big Union, though they did not regard themselves as syndicalists, are considered by most historians to belong to this current. A number of syndicalist organizations were and still are to this day linked in the International Workers' Association. José Buenaventura Durruti Dumange was a Spanish insurrectionary, anarcho-syndicalist militant involved with the CNT, FAI and other anarchist organisations during the period leading up to and including the Spanish Civil War. Durruti played an influential role during the Spanish Revolution and is remembered as a hero in the anarchist movement. The International Workers' Association is an international federation of anarcho-syndicalist labor unions and initiatives. The Iberian Anarchist Federation is a Spanish organization of anarchist militants active within affinity groups inside the Confederación Nacional del Trabajo (CNT) anarcho-syndicalist union. It is often abbreviated as CNT-FAI because of the close relationship between the two organizations. The FAI publishes the periodical Tierra y Libertad. The Zabalaza Anarchist Communist Front, formerly known as the Zabalaza Anarchist Communist Federation (ZabFed), is a platformist–especifista anarchist political organisation in South Africa, based primarily in Johannesburg. The word zabalaza means "struggle" in isiZulu and isiXhosa. Initially, as ZabFed, it was a federation of pre-existing collectives, mainly in Soweto and Johannesburg. It is now a unitary organisation based on individual applications for membership, describing itself as a "federation of individuals". Historically the majority of members have been people of colour. Initially the ZACF had sections in both South Africa and Swaziland. The two sections were split in 2007, but the Swazi group faltered in 2008. Currently the ZACF also recruits in Zimbabwe. Members have historically faced repression in both Swaziland and South Africa. The CNT-F or National Confederation of Labour is a French anarcho-syndicalist union. Alternative libertaire is a French anarchist organization formed in 1991 which publishes a monthly magazine, actively participates in a variety of social movements, and is a participant in the Anarkismo.net project. It was also a member of the International Libertarian Solidarity network. The Confederación Nacional del Trabajo is a Spanish confederation of anarcho-syndicalist labour unions, which was long affiliated with the International Workers' Association (AIT). When working with the latter group it was also known as CNT-AIT. Historically, the CNT has also been affiliated with the Federación Anarquista Ibérica ; thus, it has also been referred to as the CNT-FAI. Throughout its history, it has played a major role in the Spanish labor movement. Anarcho-Syndicalism: Theory and Practice. An Introduction to a Subject Which the Spanish War Has Brought into Overwhelming Prominence is a book written by the German anarchist Rudolf Rocker. Its first edition was published by Secker and Warburg, London in 1938 and was translated from Ray E. Chase. Rocker penned this political and philosophical work in 1937, at the behest of Emma Goldman, as an introduction to the ideals fueling the Spanish social revolution and resistance to capitalism and fascism the world over. Within, Rocker offers an introduction to anarchist ideas, a history of the international workers' movement, and an outline of the syndicalist strategies and tactics embraced at the time. The Pluto Press and the newest AK Press editions including a lengthy introduction by Nicolas Walter and a preface by Noam Chomsky. Johann Rudolf Rocker was an anarchist writer and activist. Though often described as an anarcho-syndicalist, he was a self-professed anarchist without adjectives, believing that anarchist schools of thought represented "only different methods of economy" and that the first objective for anarchists was "to secure the personal and social freedom of men".